"A friend brought these simple yet delicious and refreshing appetizers to a party recently and I've been making them ever since! They are especially good served cold during the hot summer months." 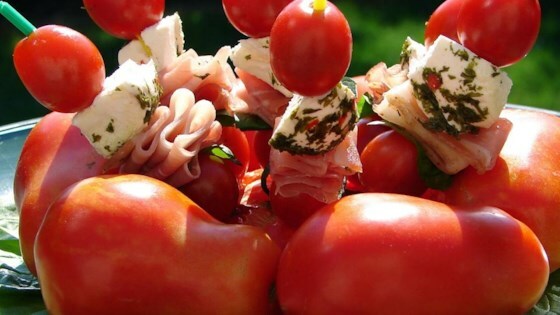 Thread each toothpick with: one tomato, 1/4 of a slice of prosciutto folded into a small square, one mozzarella ball, one basil leaf (folded if it is large), and one more tomato. Arrange appetizers on a serving platter. Drizzle with your favorite Italian salad dressing. Summer entertainment begins with freshness! *If marinated mozzarella is not available, you can make your own. Buy bite-size plain mozzarella balls, or cut large fresh mozzarella balls into bite-size cubes. Marinate in olive oil, minced garlic, chopped basil, plain or flavored vinegar, and Italian seasoning for several hours before assembling the appetizers. Extremely popular at parties! Would suggest using only one tomato, since its quite a mouthful!